Create this cute ¾ sleeve asymmetrical top with just a few easy alterations to the Princess Wrap Top #426. All of the hems are secured with a zigzag stitch, an oldie but a goody. 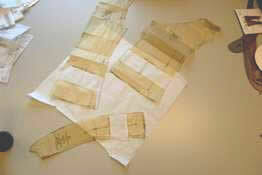 First, I added 3 inches in length to all of the bodice pieces. (The right front is not pictured here but 3 inches was added to it also). Straighten grain lines after lengthening. Next, I extended the hem on the right front pattern piece (the gathered side) 3 inches and extended the hem line up to a zero point at the side seam. This alteration affects the side front piece and they should be side by side to ensure that the new hem line transitions all the way to the side seam. A new left side front piece is traced that excludes this new asymmetrical hem extension. The right front piece will hang freely at the hem. The left front piece still needs to meet up with the right side front piece underneath. Connect those pattern pieces and draw a new hemline that trues the hems up. Draw the new line up to a zero point where it will connect with the left side front piece. 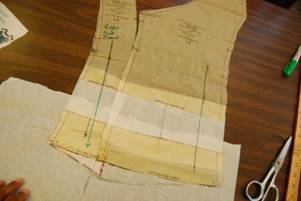 The sleeve pattern piece is shortened to ¾ length. Take a ½ clip into the fabric at the bottom notch of the gathered area in on the right front. When attaching the right front piece to the left front use a single needle machine and stop sewing right at the clip (do not sew beyond the clip). Fold the hem below the gathering and the bottom hem of the right front piece under and press. Miter the corner and sew using a zigzag stitch. Connect the left side front piece keeping the new right front piece out of the seam after the gathered point using the single needle machine. Only connect the right side front piece till the bottom of the gather. The right front has been hemmed and is meant to hang freely. 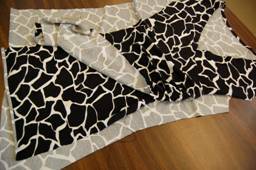 After ensuring that the right front piece has been left out of the seam beyond the gathers, go over the seam with a serger. Connect the right side front piece to the front assembly. The only difference here is the right front piece is already hemmed. The rest will hemmed later.